After expanding too much too soon, two companies in this year's list are awash in red ink. In the intertwined fates of two companies, we see a painful lesson in high finance apparent in this, our 40th annual Top 100© listing of U.S. and Canadian food and beverage processors: Don’t expand too much too soon. If it weren’t for a little financial sleight-of-hand, ConAgra Foods and Post Holdings might be the same company at this point. So there’s no telling how that would have impacted (or compounded?) their respective $607 million and $359 million losses, the biggest on our table. Post, which moved up from No. 85 last year to No. 49, can claim the biggest one-year sales jump on our chart on (up 133 percent). After this cereal-only company was spun off in a poison pill attempt by Ralcorp in 2012 (it did not work; ConAgra acquired Ralcorp anyway), it weighed in at a measly $959 million in sales. But Post quickly went on a buying spree, netting Dakota Growers Pasta, Golden Boy Foods, Dymatize Enterprises, Agricore United Holdings and the private label cereal business of Hearthside Solutions. But its real jump in sales came with the 2014 acquisition of Michael Foods, which alone added nearly $2 billion in sales. The purchase earlier this year of MOM Brands, formerly Malt-O-Meal, will push it even further up next year’s chart. But that kind of merger and acquisition activity also brings a heavy burden of debt, helped in no small way by its $359 million loss in 2014. The dubious distinction of biggest loss ($607 million) belongs to ConAgra – which also incurred that red ink as the result of a big acquisition and a big (38 percent) jump in sales. As we said, Ralcorp resisted ConAgra’s overtures for much of 2012, even spinning off Post Foods to make itself a less attractive takeover target. But ConAgra’s former CEO wanted that private label business badly … and that’s exactly what he got. ConAgra (over)paid $6.8 billion for the cereal-less Ralcorp, even more than it first offered for a Ralcorp that included Post. For whatever reason, the business never fit into ConAgra well and sales never took off. Quarterly financial reports over the past year invariably used the term “lagging.” Gary Rodkin, the CEO who engineered the deal, announced his intention to retire at the end of ConAgra’s fiscal year, this May 31. He was replaced by Sean Connolly, who had recently lost his job when his Hillshire Brands Co. was bought by Tyson last August. By the way 1: That private label business, apparently including ConAgra’s sizable homegrown business, is up for sale, Connolly announced in July. By the way 2: Connolly may have been saved by Tyson from a similar fate. Analysts questioned his $4.23 billion offer to buy Pinnacle Foods, which was terminated as a result of Hillshire’s acquisition by Tyson. But that’s part of the circle of life in this food and beverage industry, which each year causes a few venerable, often old, names to disappear and new ones to appear at the bottom of our table. Every year there are some comings and goings, but in the past year we lost several significant companies: Big Heart Pet Brands (the former pet food business of Del Monte, sold to J.M. Smucker), Canada Bread (sold by majority-owner Maple Leaf Foods to Grupo Bimbo), Hillshire Brands (acquired by Tyson) and Michael Foods (bought by Post Holdings). Two companies are still on the list with slightly different, and longer, names. Beam Inc., distiller of all those wonderful bourbons, is at No. 61 as Beam Suntory. Del Monte comes in at No. 65 as Del Monte Pacific Ltd., the result of its sale to a Singapore firm and former licensee. Also, Lactalis American Group, former No. 36 on our list, has been fully folded into Parmalat North America (No. 44). It’s confusing, but Parmalat SpA is majority-owned by Lactalis’ French parent, which engineered the sale. Lactalis American Group owned the Sorrento, Precious and Président brands here in the States. Among other comings and goings, Dole Foods has dropped off our list, largely because early last year it sold its packaged foods business to Japanese firm Itochu Corp. for nearly $1.7 billion. The division represented a third of Dole’s revenue. But also because David Murdock, chairman and CEO of Dole Food Co., who already owned nearly 40 percent of the stock, took the company private again, and we can’t ascertain how much if any value-added/processed food is left. That, by the way, explains a lot about our list. 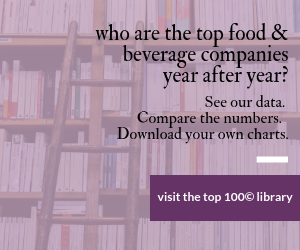 We rank companies based on value-added/consumer-ready (but not necessarily in final form) foods and beverages that were manufactured in U.S. and Canadian plants. That’s tough enough to figure out for the public companies; for the private companies, we rely on their voluntary statements to us and other public reports about their financial figures or the general health of their business. That’s why PepsiCo appears as a $38 billion company, not the $67 billion global manufacturer that it is. And Cargill appears as an $8.6 billion processor, not a $135 billion owner of ships and trains around the globe. ADM is not on the list at all. Unilever is portrayed as an American food processor, not a global maker of shampoos and deodorants. And Monster Beverage Corp., even at nearly $3 billion in sales, is not on this list (the company admits it manufactures none of its own beverages, all are done by copackers). We use the most recent fiscal year available; in most cases that’s calendar 2014. So you won’t find this list or these numbers anywhere else. They are uniquely computed by Food Processing. Seven companies had net losses, which is the biggest number of losers in at least four years (last year four reported red ink). While the biggest sales increase belongs to Post with ConAgra not far behind, a number of other companies also grew impressively without sinking into red ink. It’s hard to move the needle on a $30 billion company, but Tyson (No. 2) did so, increasing sales more than 9 percent, largely through the acquisition of Hillshire. And increasing profits, too. Constellation Brands (No. 26) reported a 24 percent jump in sales. It only distributes many famous brands of alcoholic beverages, but Constellation owns most of the wineries behind its domestic wine brands, and it became a major brewer with the recent purchase and completion of a brewery just south of the border, brewing the licensed Mexican beers it distributes in this country (Corona, Modelo, Pacifico, Victoria). Boston Beer Co. (No. 92), just barely made our list last year, but is growing into a $1 billion company, thanks to small acquisitions and the popularity of a non-beer: Angry Orchard hard cider. Some companies are designed to be acquirers. WhiteWave Foods Co. (No. 39), our 2014 Processor of the Year, jumped 37 percent, benefiting from the 2014 acquisitions of Earthbound Farm and So Delicious (sales from which we do count) and a joint venture with China Mengniu Dairy Co. (which we don’t count). TreeHouse Foods (No. 38) grew 28 percent, increasing its private label holdings with a few buys last year, including $697 million (in sales) Flagstone Foods. The price of milk, like most commodities, can swing wildly from year to year. If milk is a big portion of your products or portfolio, it can inflate your sales without necessarily improving profits. Milk prices, which averaged $20.05 in 2013, averaged $23.98 per hundredweight in 2014, nearly a 20 percent increase. That helps explain the 35 percent jump at Dairy Farmers of America (No. 26) as well as increases at Dean Foods (No. 12) and Land O’Lakes (No. 24), as well as at the smaller dairies. A number of foreign companies showed sales increases in euros 2014 over 2013, but did not show increases when those numbers were converted to dollars (the euro was worth nearly $1.38 on Dec. 31, 2013 but was under $1.22 on Dec. 31, 2014). Glanbia’s worldwide figure was an example. Speaking of dairy products, Chobani (No. 88) has been suspiciously quiet lately. The private company, which was our 2012 Processor of the Year, has always volunteered a sales figure, but this year declined to provide one. Chobani’s sales grew more than 30 percent in 2013 to $1.1 billion (about $1 billon of that manufactured in the U.S., according to our figuring), when it peaked in market share of the Greek yogurt category, claiming 48 percent, according to some estimates. But the company suffered a number of setbacks since. At the end of 2013 it was forced to recall products when mold began appearing in cups made at its then-new, half-billion-dollar plant in Twin Falls, Idaho. About the same time, Whole Foods Markets, which helped catapult the company to success, announced it would stop selling Chobani yogurt in 2014 because the processor could not guarantee a GMO-free label. New products (Chobani Oats and Chobani Kids) have underperformed. Dannon and Yoplait jumped in the Greek yogurt category and immediately marketed themselves to success. And there are plenty of new exotic-sounding yogurts (Australian, Icelandic, Asian, French) to appeal to consumers who insist on the newest thing. As a result of all that, we kept Chobani’s sales estimate at $1 billion … and that may be generous. This will be the last time you see Heinz and Kraft listed separately. Recently privatized Heinz and recently divorced (from Mondelez) public Kraft merged into Kraft Heinz Co. just a month ago. They will appear as Kraft Heinz Co., a public company, on next year’s table. New this year are B&G Foods, Gorton’s Seafood, High Liner Foods, Koch Foods, Premium Brands and Ruiz Foods. Just announced in July, Brazilian meat packer JBS’ U.S. subsidiary Swift Pork has agreed to buy Cargill’s U.S. pork business for $1.45 billion, in what JBS President Martin Dooley called a “strategic investment” in the company’s global expansion. The deal includes processing plants, feed mills and hog farms in six states. Looking for clues to the health of the U.S. and Canadian food and beverage industry. Last year brought busy times for food industry mergers and acquisitions.